The supreme sacrifice and selflessness of our brave men in uniform is a matter of great pride for the nation. Paying homage and support to India’s bravehearts, noted actor Akshay Kumar in association with Ministry of Home Affairs, Government of India launched an online campaign ‘BharatKeVeer’, appealing public to donate funds and help the families of the martyrs. Inspired by the idea, even corporates are stepping in to do their bit for the unsung heroes and their families in their own unique ways. 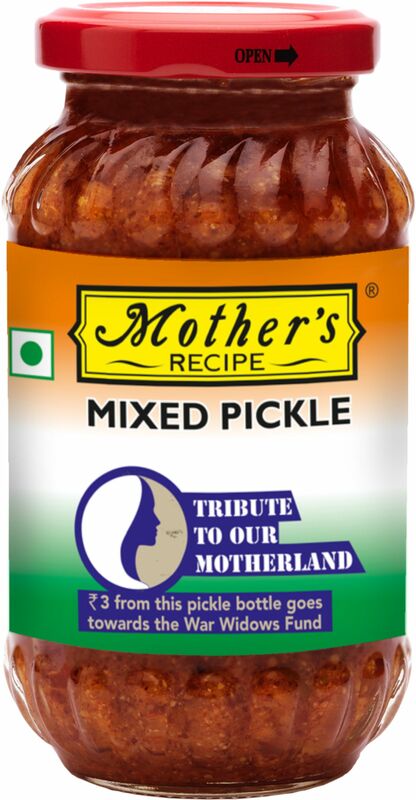 Mother’s Recipe, one of India’s leading FMGC brand who is also a strong believer of giving back to the society through its various social acts, initiated ‘TRIBUTE TO OUR MOTHERLAND’ campaign. Under this initiative, the company will contribute Rs 3.00/- from the sale of every special edition Mothers Recipe 500 gm pickle bottle. The select product range will be only available in Canteen Stores Department (CSD) across the nation till January 2018. Additionally, to reach out and connect with a larger set of audience, Mother’s Recipe is amplifying the campaign on various social media platforms using a unique hashtag #EkAchaarDeshKeNaam. For each comment, like, shares, tweets / retweets related to the campaign, Mother’s Recipe will contribute a certain amount towards the cause. The initiative is already a hit on the digital platforms and has reached more than 5 lakh people, received 75,000+ reaction and 2000+ shares. The entire campaign both on-ground and online aims to raise a substantial amount of funds which will be donated to the Army Wives Welfare Association (AWWA) on the occasion of Republic Day. The amount generated will be utilized for the welfare of the war widows and their families. The initiative hopes to sensitize public and create awareness among CSD consumers that they can support this noble cause by simply purchasing Mothers Recipe products or supporting the cause online. Overall, the initiative is being extensively promoted through online advertisements, in-store branding, geo targeting, social media posts and stories. “We urge and anticipate more and more people to come forward to support the cause, so that maximum amount is collected for the families of our war heroes,” Sanjana concludes.